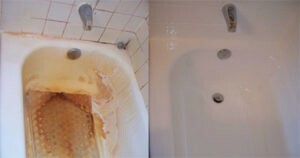 Which surface do you have that needs refinishing? Porcelain, Tile, Acrylic? 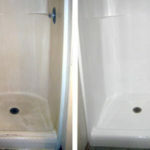 Acrylic, Cultured Marble, Fiberglass, Formica, Porcelain, or Tile ... we can refinish all of these surfaces! Click on an image below to get to the specific area of refinishing in which you're interested - or, click here for information on how to get a QUICK BID. Acrylics have a smooth finish, offer good heat retention, and are non-porous. The down side to acrylics is that the finish is soft and can scratch easily. 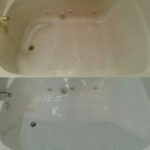 Over time, it's common for the tub bottoms to develop stress cracks, because acrylics are not reinforced well and can feel flimsy. Cultured Marble has a "swirly," "speckled," or "veiny" look to its high-gloss finish, but some finishes can look like a solid color. Cultured marble is a man-made material that offers durability and resistance to stains, chipping, and abrasion. 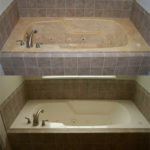 Cultured marble bathtubs are always oversized, and round or oval in shape. Fiberglass is lightweight and inexpensive, but it also has a low shine, is prone to stress cracks, and typically does not have a smooth surface. Fiberglass material is porous in nature, so it has a tendency to absorb water. In addition to that, the surface is brittle, which makes it prone to stress cracks. Before granite became so popular, most kitchen countertops were made of formica, which is a hard, durable, heat-resistant plastic laminate. 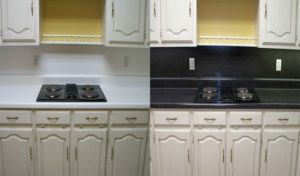 Refinishing in MultiSpec gives countertops the appearance of granite without the higher price tag. The base for a porcelain tub or sink is made of either steel or cast iron, and is specially designed for "enameling" (baking a porcelain finish on top). 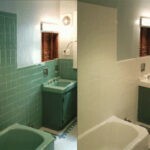 We call these types of tubs and sinks "porcelain," and they are the most common type found in homes built before the 70s. There are typically 2 places in a home where you will see tile installed - the kitchen and the bathroom. In the kitchen, tile can be found on the countertops and backsplashes. In the bathroom, tile can be on a countertop, on the walls surrounding the bathtub, or even on the bathroom walls.